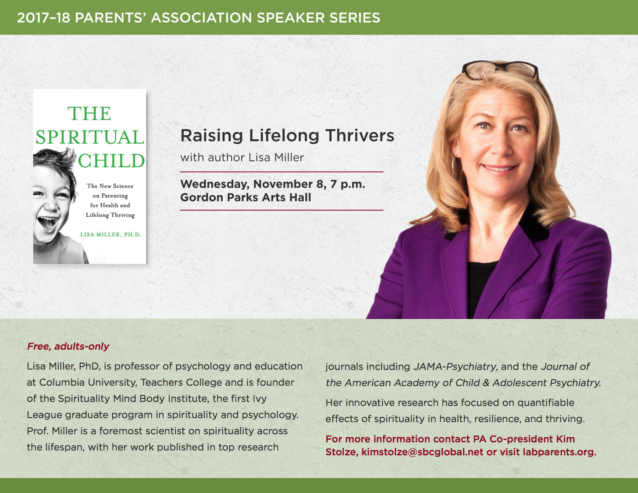 Please join us for an informative evening with Dr. Lisa Miller, noted clinical psychologist, and the author of “The Spiritual Child: The New Science on Parenting for Health and Lifelong Thriving.” RSVPs are strongly encouraged. This is a free, adults-only event, and childcare is available (for children ages 3 and up is available). If you would like childcare, please email Amanda Norton by November 6. Lisa Miller, PhD, is Professor of Psychology and Education at Columbia University, Teachers College and is Founder of the Spirituality Mind Body Institute, the first Ivy League graduate program in spirituality and psychology. Dr. Miller is a foremost scientist on spirituality across the lifespan, with her work published in top research journals including JAMA-Psychiatry, American Journal of Psychiatry, and the Journal of the American Academy of Child & Adolescent Psychiatry. Her innovative research has focused on quantifiable effects of spirituality in health, resilience and thriving, and an overall sacred and joyful life. Her clinical and consultation work focuses on spiritual awareness and spiritual growth, for individuals, families, groups and organizations. To read more about Dr. Miller, and the book “The Spiritual Child” please visit the website www.lisamillerphd.com. « Bookswap is coming! Collection starts November 6. Parent Volunteers Needed!